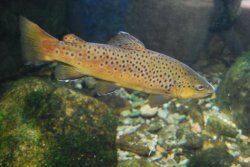 The Pere Marquette River, referred to by the locals as the “PM” was the first river in North America where the German Brown Trout were planted 130 years ago. This is one of the best fisheries in the Great Lakes area for German Brown and Steelhead Trout. The Pere Marquette River starts near the town of Baldwin and eventually ends up in Lake Michigan near Ludington. The PM runs about 30 miles once the Little South and Middle Branch meet up at Marlborough. There are some nice size Brown's in the Middle Branch before it joins the main river. This section is not very wide and very easy to wade. The first 8 miles or so of the main river have special catch and release regulations. This stretch is a very classic trout stream with nice pools and runs. The first part of this stretch is easy to wade and the bottom section is more difficult because the water picks up some speed. From Gleasons Landing to Lake Michigan, about 20 miles, the river has some great fly fishing. You will need to float this section as it is even wider and faster. It should be worth the effort, the fish in this section can be quite large. You will find many 20"+ Browns and some Steelhead with double digit weight. That is why this river is so popular, the chance to catch big fish! Some popular fly patterns include Egg, Hex, Caddis, Stoneflies and Mayflies. Leeches and Sculpin patterns work pretty well also to help land the big fish. The river also has runs of Steelhead, Chinook and Coho Salmon. The Steelhead start showing up in March and the peak will end by mid April. During this short time frame the fishing can be amazing or better! This river almost always has something to offer the fisherman, which is perfect for the locals who fish year round. Michigan has some great trout streams and this is among the best. Not too many streams in the country have both trout and Steelhead, but this is one of them. This river has pretty good access on the top half and the bottom half of the river. 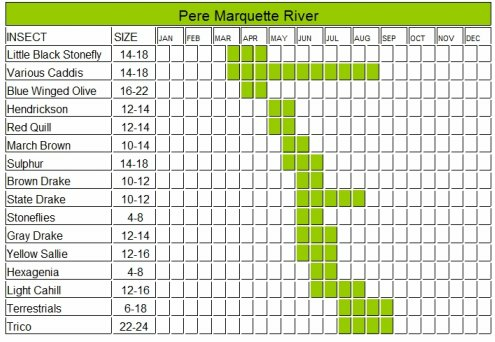 Click here to leave the Pere Marquette River page and return to Michigan home page.